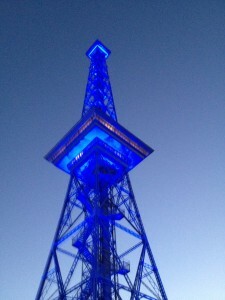 The Radio Tower / Funkturm was Berlin’s very first broadcasting tower. It is located close to both Berlin fair ground (Berlin Messe) and ‘House of Broadcasting‘ (Haus des Rundfunks). The tower was inaugurated on 3 September 1926 on the opening of the third ‘Great German Radio Exhibition’ (Große Deutsche Funkausstellung). The tower looks a little bit like a small ‘cousin’ of Paris’ Eiffel-Tower: a steel framework construction with a restaurant floor in mid height and an observation deck at the top. On March 22, 1935, the very first regular television program in the world was broadcast from this area on top of the tower. With a total height of approximately 150 meters the Radio Tower is a rather small tower, at least compared to TV-Tower with its total height of 368 meters. But in contrast to TV-Tower, you can actually go to a ‘second’ open air observation deck – an experience that can be both: exciting and a bit scary. Looking East, the view from the observation deck is a rather typical ‘West Berlin View’ – and if you happen to know the movie ‘Wings of Desire‘ (‘Himmel über Berlin‘, 1987, Wim Wenders) then you might actually know the view towards the city center / autobahn from the opening scene. To the West / South-West you can see the forest Grunewald, crowned by the former US American spy station – or actually NSA listening station on top of Teufelsberg. The long straight road you may notice, beginning almost at the foot of the Radio Tower / at the intersection to ICC, is the AVUS (‘Automobil-Verkehrs- und Übungsstraße’), opened in 1921 and until 1998 also used as a motor racing circuit. The observation deck is open on Mondays 10 a.m. – 8 p.m.
and Tuesday to Sunday 10 a.m. – 11 p.m. 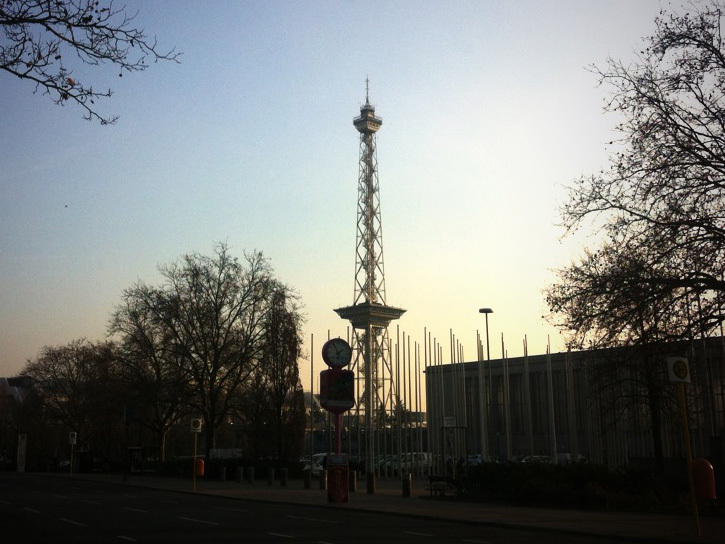 The easiest way to get to Berlin Radio Tower / Funkturm is probably by S-Bahn Messe Nord / ICC.